When he was running for mayor four years ago, Bill de Blasio promised he’d create a universal pre-K system. It was up and running within nine months of his inauguration. He said he’d reduce the NYPD’s use of stop-and-frisk, and he did so. He vowed to create affordable housing, reduce the speed limit, create new sick-leave and living-wage provisions, reinvigorate the city’s ferry system, create new rental vouchers for the homeless. And he has done or is doing some degree of all these things. This article was produced in partnership with City Limits, an urban-affairs news site covering New York City. So why does no one seem to believe the mayor when he says he wants to close Rikers, the vast jail complex that has come to symbolize some of the worst abuses of the criminal- justice system? In part, it’s because for two years, as the chorus of voices calling for New York City to shutter the island’s outmoded and isolated jail grew larger and louder, de Blasio dismissed them. Then, when de Blasio finally changed his mind on the last day of March, he announced it at a hastily arranged Friday-night press conference, 48 hours before an independent commission was almost certainly going to recommend closure. Since then, he has dragged out the timeline for emptying Rikers, suggesting a 10-year timetable as a minimum estimate, not an outside figure. And when the mayor finally released his plan for closing the complex—nearly three months after announcing his new position—the blueprint placed a large share of responsibility for achieving Rikers closure on other officials and said little about where new jails would go. Can New York’s Mayor Do More to Protect Immigrants From ICE? The biggest reason for the doubts about de Blasio’s devotion, however, is that closing Rikers will require tough decisions. And de Blasio’s critics believe that during his first 42 months as mayor he has shown little appetite for making those kinds of calls in the politically perilous area of criminal justice—a policy area where this mayor faces unusually high expectations and especially acute risks. Many of the mayor’s political foes—the tabloid editorial boards, for instance, and the correction officers’ union—will push to derail the plan to close Rikers, whether now or in a few years when a new person occupies Gracie Mansion. But now there is an opposing force as well: a feisty advocacy campaign, #CloseRikers, that has shown a gritty commitment to demanding change rather than waiting for it. The potential for cities to serve as laboratories for progressive ideas stems not just from the fact that urban areas are home to left-leaning voters, but also from the truth that cities are where policy problems are harder to ignore or render abstract. Crumbling infrastructure slows your ride to work. Undocumented immigrants live and fear next door—or in your own home. The homeless spend their days in the park down the street. Of these urban realities, crime is the most vexing, because it’s where fear distorts a real threat to irrational proportions. Indeed, a grim reminder of the ongoing tragedy of violent crime in New York came early Wednesday morning, when, according to reports, a man with a gun walked up to a mobile NYPD command center on a Bronx street, pointed a gun at a 48-year-old cop, and killed her. He was shot dead in a second encounter with officers a short time later. The cruel reality is that there will always be crime in US cities, though crime is for the most part much rarer than it used to be. Jails are part of the criminal-justice infrastructure designed—ostensibly—to keep crime at bay. Of the 2.17 million people incarcerated in the United States in 2015, a third were in local jails—a proportion that has remained consistent over the past decade. While state and federal prisons get ink because of their notorious inmates and lengthy sentences, jails are where the most insidious problems of the justice system are manifest—where people who are presumed innocent endure lengthy waits for trial, where a transient population typically receives few of the social services that might prevent them from getting arrested again after release, where punishment for low-level crimes is most likely to occur. Thanks to grassroots activism and official investigations, leaders in cities like Los Angeles and Chicago have have come to recognize that jail systems—and closely related bail systems—are in desperate need for reform. But in LA and the Windy City, as well as places like New Orleans, reform efforts have bogged down. Now New York is contemplating the boldest change of all. Thanks to an active grassroots campaign, it stands a chance of actually accomplishing it. For 85 years, Rikers Island has been part of the landscape of crime and punishment in New York. A 413-acre land mass in the East River, it is where the Department of Correction runs 10 jails that hold an average of 9,500 people on a given day, the bulk of the city’s prisoners. Some of the people detained there have been convicted and sentenced to terms of more than a year, and are awaiting transfer to state prisons. Others have been found guilty and are staying on Rikers to serve terms of less than a year for misdemeanors. The vast majority (78 percent at last count) are pre-trial detainees, presumed innocent and—for the most part—incarcerated because they couldn’t afford financial bail. There have been at least two efforts to close Rikers in the past, one under Mayor Koch and another, subtler one under Mayor Bloomberg. Neither got traction. Mostly, the notion has been unthinkable. “When I was commissioner it was more about just trying to get control of the place. I’m sure at that moment closing Rikers would have had a ring of other worldliness,” says Michael Jacobson, correction commissioner under Mayor Rudy Giuliani and now a noted reformer who sat on the commission that recommeded closing the island. Jail reform wasn’t on de Blasio’s agenda, or anywhere on the radar screen of the city’s political class, when he ran for mayor four years ago. 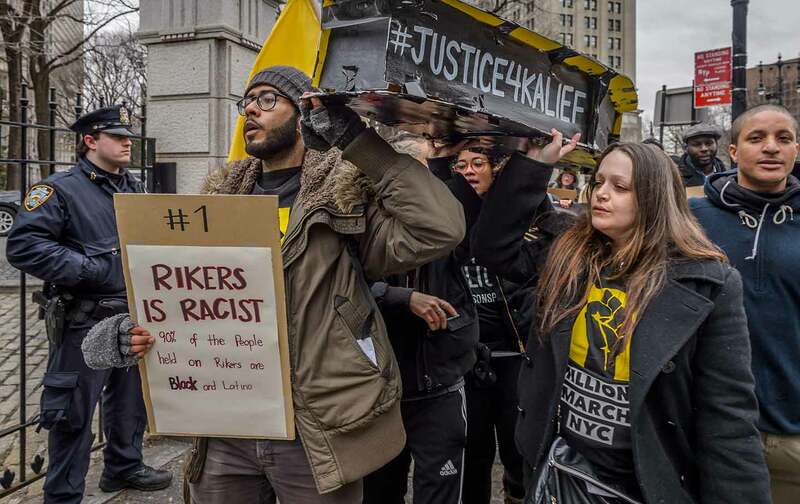 But de Blasio did dive deep into other aspects of criminal-justice policy, soaring to the front of the 2013 race with an ad in which his biracial son talked about the racial skew of the NYPD’s stop-and-frisk regime. De Blasio promised to sharply reduce the use of that tactic, which was already falling in the final years of Mayor Bloomberg—thanks to a grassroots campaign and federal lawsuit to end the practice—and he has done so. De Blasio also cut back on arrests for low-level marijuana crimes, launched a new community-policing program, and put more emphasis on addressing the mental-health causes of crimes. Is Bill de Blasio the mayor who can change the role that jails play in the city? Mid-way through de Blasio’s first year in office, the US Justice Department issued a scathing report on Rikers. It found that the Constitutional rights of adolescent males there were violated by “rampant use of unnecessary and excessive force by staff” as well as by widespread “violence inflicted by other inmates”; it condemned the use of “solitary confinement at an alarming rate and for excessive periods of time.” Then–Manhattan US Attorney Preet Bharara called Rikers “a broken institution.” His office sued late in 2014, and settled with the city in mid-2015 after de Blasio’s team promised a raft of reforms, from a new use-of-force policy to an end to solitary confinement for people younger than 18. That was enough for the Justice Department. But there was a larger movement afoot that was less easy to satisfy. In October of 2014, New Yorker writer Jennifer Gonnerman published an article about the infuriating and deeply sad story of Khalief Browder, who spent the better part of three years on Rikers after being arrested at age 16 on suspicion of stealing a backpack. When Browder, his life wrecked by his time behind bars, committed suicide in June of 2015, protesters marched on the island. The following month, Marshall Project founder Neil Barsky penned a New York Times op-ed titled “Shut Down Rikers Island.” In the fall of 2016, City Limits and City & State co-published a series looking at the case for and challenges of closing Rikers in which reporter Ed Morales surveyed all municipal elected officials. A few supported closing Rikers, but most clammed up. Over the next few months, however, more leaders—including Melissa Mark-Viverito, the speaker of the City Council—came out as pro-closure. New York State Governor Andrew Cuomo soon joined the chorus. #CloseRikers, led by Just Leadership USA’sMartin but including a long list of progressive groups, stepped up the pressure. There was a big march in September 2016 featuring Emily Althaus of Orange Is the New Black and entrepreneur Russell Simmons. December saw a Gracie Mansion protest. In February of this year, #CloseRikers protested outside the mayor’s State of the City address at the Apollo Theatre in Harlem and broadcast a TV ad slamming de Blasio for boasting of New York as a “sanctuary city” while continuing to operate a notorious penal colony. March saw a small but hearty band of #CloseRikers protesters rally outside a De Blasio event all the way down in Broward County, Florida. Over the course of less than two years, #CloseRikers went from a fringy group collecting signatures outside Hostos Community College in the Bronx to something the mayor was asked about in his weekly sit-downs with the city’s main political talk shows. De Blasio has not credited #CloseRikers for his shift to supporting Rikers closure. Rather, he has given kudos to City Council Speaker Mark-Viverito for continuing to press him and offer ideas for how to achieve the goal of closing the jails on the island. De Blasio’s staff insists the mayor was never opposed to the idea, and news reports published in early 2016 indicated City Hall was exploring its options behind the scenes. For his part, the mayor has said that as months went by and the population on the island continued to shrink—the average daily population of the city’s jails has dropped by nearly a third since 2010—it became clear to him that what had seemed impossible was really not. Two days after de Blasio came out for closing Rikers, the commission led by former Chief Judge of New York State, Jonathan Lippman outlined a multifaceted approach to demolishing Rikers in the next 10 years. It proposed holistic crime prevention efforts in high-crime neighborhoods; diverting people at the point of arrest to civil courts when possible; eliminating money bail; and building smaller jail facilities in each of the five boroughs. The idea is to reduce the jail population to a point where it can be moved off the island into smaller facilities whose programs and layout reflect 21st Century thinking about correction. De Blasio long ago embraced many of the commissions ideas and has already taken action on some of them, like bail reform and new mechanisms for keeping the mentally ill out of the criminal justice system. His own plan for closing Rikers, released in late June, embraces many of the commission’s recommendations, like replacing short jail sentences with community service assignments. It’s odd stuff to hear from a mayor who is planning to push through a dozen massive rezonings, and who earlier this year said he hoped to create 90 new homeless shelters around the city: Council support has not been identified as a precondition in any of those episodes. But it’s far from the only place in the mayor’s Rikers plan where he passes the buck to other officials: The report is dotted with asterisks to identify steps that “require action by parties other than the city.” The stipulation isn’t untrue—the Council, state government, and district attorneys certainly have a role to play—it’s just not typically the thing a mayor identifies in the public game-plan for what will be a key part of his legacy. To close Rikers, the city is likely going to have to figure out a way to allow more inmates facing serious charges to await trial at home. That kind of hedging has helped feed the fear that de Blasio doesn’t really intend to close Rikers—or, at least, won’t push to make it happen. While the Lippman Commission said it believed it was possible to get the Rikers population down to around 5,000 on an average day—the level at which smaller, borough jails could absorb everyone—de Blasio’s plan only commits to a reduction from the current 9,400 or so to 7,000 over the next five years. On Friday, June 23, 9100 people were incarcerated on Rikers Island. Some 6300 of them were pretrial detainees. Murder in the second degree was the charge facing the greatest number of defendants, 487 of them. First degree robbery, attempted murder and second-degree assault—a D felony—rounded out the top four. Those four crimes comprised about a fourth of the pre-trial population. Now, those are merely charges, the people facing them are presumed innocent, and sometimes prosecutors overcharge as a negotiating tactic. But those are serious allegations, not the product of much-derided “broken windows” policing that focuses on minor, quality of life crimes. While many people picked up for low-level crimes do end up Rikers Island—and that is a problem unto itself—because of the short stints those defendants tend to serve, when it comes to the problem of how to close the island, ending “broken windows” is only part of the picture. Both the mayor and the commission have called for further reductions in crime to drive down the number of serious charges. De Blasio already is implementing a neighborhood policing strategy that embeds cops in the community and links policing to social investments and physical improvements, like lighting, that can deter crime. But crime is already at historic lows. In order to get deep reductions in the Rikers population, the city is likely going to have to figure out a way to allow more inmates facing serious charges to await trial at home, not behind bars. The Commission has called for expanding supervised release to, in some cases at least, “violent felony defendants and defendants charged with domestic violence offenses.” De Blasio has not. The political risks in doing so are obvious, and that’s what makes advocates nervous. De Blasio has always faced suspicion and derision over his ability to keep the city safe, and some of his opponents promote the canard that the city has become chaotic and dangerous on his watch (or at least that it “feels less safe,” my personal favorite). After two cops were killed in late 2014, de Blasio faced a near-mutiny by the NYPD and became more timid. While he has accomplished real criminal-justice reforms, he has stopped short on others. He didn’t support a choke-hold ban or a bill that would improve notification around police searches, and his administration rolled back access to police disciplinary records. He has steadfastly defended “broken windows” policing and expanded the city’s 35,000-strong police force. If he’s reelected in November, the city’s term limits mean that de Blasio will oversee only the first five years of the Rikers closure effort, meaning he could be planning to reduce Rikers’ daily population to 7,000 and ride off into the sunset. But it would be a huge gamble to leave the heaviest political lifts to a now-unknown mayor of the future. But is Bill de Blasio the mayor who can push criminal-justice reform past the low-level crimes, deep into the territory where deep fears and potentially dangerous people live? Can he really change the role that jails play in the city? Advocates have already started pushing to answer those questions: One #CloseRikers advocate snuck into the gym where de Blasio works out one morning late last month to push him to speed up the timetable for shuttering the jails. “We’ll talk later,” said a stretching mayor. Closing Rikers does have its opponents, like the Republicans challenging de Blasio’s reelection and the correction officers union. And there are plenty of reasons to think it won’t happen. “Anyone can pick one of them and say, ‘How are we ever going to do that? That’s ridiculous,’ whether it’s the siting, the population reduction, the cash cost upfront—there are real issues,” says Jacobson, the former correction commissioner. “We recognize this is going to take a huge effort, its just that at the end your going to get huge benefits,” including, he suggested, a large of plot of usable land, cost savings, and a more just justice system. Some worry that the moment will pass without real action. City Council Speaker Melissa Mark-Viverito, who pushed de Blasio to support closure, will leave office at the end of 2017. It’s unclear her successor will be so reliable an ally of #CloseRikers. “The only way we’re going to get to close Rikers is if the council pushes him hard and there’s no guarantee that the next speaker will do it,” Lancman says.